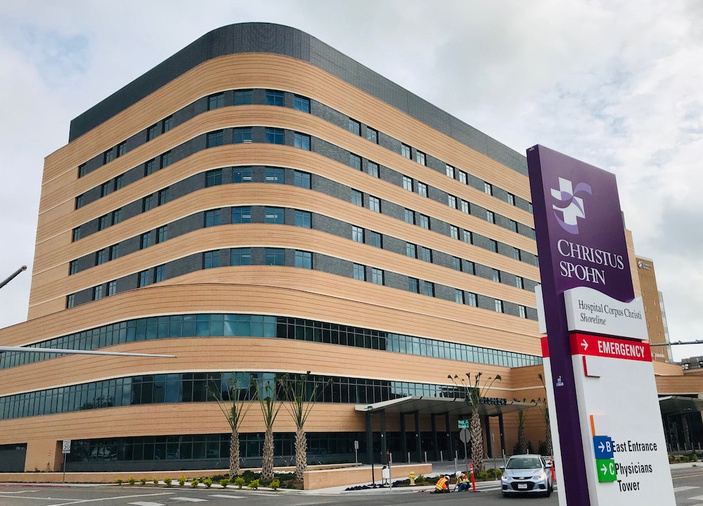 The new North Tower at Christus Spohn Hospital Shoreline opened to the public March 28, completing the facility’s five-year rebuilding project. A new chapel in the tower was used to hold a special Mass after a ribbon cutting celebrating the $335 million project — the single largest investment by Christus Spohn in any of its worldwide properties. New patients will begin using the facility this month. A faith-based health care ministry, Christus Spohn has been providing medical services to South Texas since 1905. It is an international Catholic, not-for-profit health care system with more than 600 centers, including hospitals and clinics, around the world. The organization has six hospitals and six family health centers in the Coastal Bend. The new tower at 600 Elizabeth St. includes 200 patient beds and is home to an emergency department and level II trauma center — the only level II trauma center in a 12-county region. The center has 55 emergency beds and four resuscitation rooms large enough for full teams of health care and emergency personnel. One of several innovations in the facility will be decentralized nurses’ stations. Computers and chairs have been installed between rooms with windows so nurses can observe patients as they check electronic medical records. The 200 total patient beds are all individual rooms with no shared space. An intensive care unit on the fourth floor has 32 beds. The inpatient rehabilitation unit is on the ninth floor with 28 beds and a large gym and physical therapy area. The new chapel, where the Mass was held, was built using 36 stained-glass windows from the Welder Chapel, which served the older facility for the past 70 years. The new, larger chapel is on the first floor of the new tower. Some of the windows, which have been restored, are 17 feet tall. According to hospital officials, the expansion created nearly 900 jobs and generated more than $400 million in economic activity in the Corpus Christi area. Now that it is complete, the hospital system plans to move on to demolishing the old Memorial Hospital at 2606 Hospital Drive. Demolition is expected to begin next year.